When it comes to a cricketer’s clothing, one of the most important is perhaps the batting pad. Also known as leg guards, this is an essential for both novices and seasoned players. Generally speaking, it will offer optimum protection for the knee, shins, and thigh. Considering that cricket is a contact sport and injuries are common, batting pads are non-negotiable for protective clothing. When searching for the best within the product category, one of the first things that deserve your attention would be the features. There are seven main parts: face, knee roll, top hat, wings, straps, instep, and inners. See to it that each part is well-designed to offer the highest level of protection that you need. The right choice of material is also a critical concern. Leather, polyvinyl chloride, polyurethane, and fiberglass are amongst the most common. Your comfort is also a critical factor to consider. It is important to pick one that has the right size, which will prevent your movements from being restricted. If they are too large, it will be impossible to run in between wickets. If they are too small, meanwhile, they won’t deliver the right level of protection. 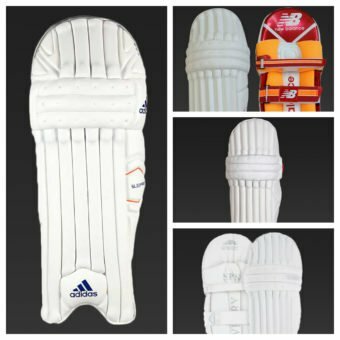 Among the different options, GM cricket batting pads are some of the most popular. One of the best features of their leg guards is the PORON XRD. The latter is an innovative material that can effectively dissipate shock 90% better compared to most of the options within the competition. A polyurethane or mesh instep is also common in their products, which can be exceptional when it comes to durability. The leg guards from Kookaburra have also been given favorable feedbacks by international cricketers. The use of high-density foam is one thing that gives them an edge above many others, which significantly improves its protective capabilities. When it comes to comfort, they can also be impressive. One feature that makes sure of this is the Contour+, which does not only provide additional cushioning, but also enhances protection. Meanwhile, with Gray-Nicolls batting pads, you can also expect nothing but the best. In most of their products, one of the most exceptional features is the presence of a knee bolster, which ensures proper fit and protection. They also have padded straps for additional comfort and premium Velcro to make sure that the pads will stay in place regardless of the intensity of your movements. SS Ton also has an extensive collection of the best leg guards. Available in both junior and adult sizes, there is something for everyone. Their pads have well-thought design and utilizes the most advanced materials that are available, which result to a protective gear that is exceptionally lightweight and comfortable. If you are looking for the best batting pads, we got you covered! Browse through our wide selection of leg guards from some of the best companies in the global market. We can assure you that they are not only high-quality, but they are also available at prices that won’t hurt your wallet.